WASHINGTON -- America's 99 percent are not just imagining it. The gap between the incomes of the rich and poor in this new Gilded Age is strikingly broad and deep, according to an October report from Congress' data crunchers. 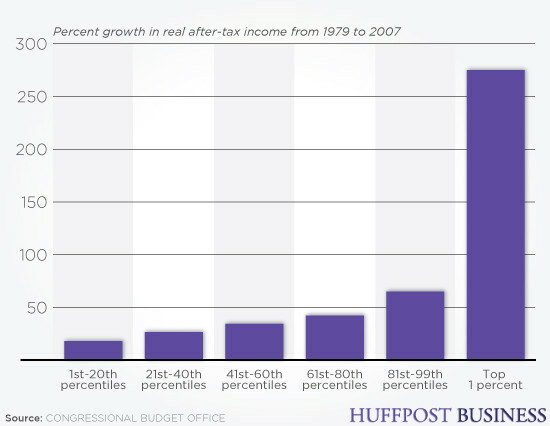 And although incomes at all levels have risen some, they've skyrocketed for the very wealthiest of earners. But it's among the top 1 percent where the growth was breathtaking. That contingent saw their incomes spike by 275 percent. "It is really stunning the degree to which rewards have been concentrated at the top," said Josh Bivens, an economist at the left-leaning Economic Policy Institute. "We have now returned to Gilded Age levels of inequality." The CBO report revealed some other stark facts. While incomes did rise up and down the ladder, the explosive growth for the top 1 percent so vastly outweighed the expansion further down that the top 1 percent's share of the nation's total income more than doubled to just over 20 percent. The hoarding at the top was so great that even after accounting for taxes, the "income received by the 20 percent of the population with the highest income exceeded the aftertax income of the remaining 80 percent," the CBO found. This week's report is far from the first to point out rising income equality in the United States. Numerous studies have shown that America's very highest earners have been steadily pulling away from the rest of the population for a generation. The CBO report did not entirely explain why the gap has expanded, but noted that salaries for "superstars" -- top earners in sports, entertainment and the corporate world -- have jumped out of proportion to other workers' income. The report also noted that capital gains income has spiked much more than cash coming from interest, dividends or pensions. But even the surge in top-level compensation doesn't explain all the growing disparity. "Without that growth at the top of the distribution, income inequality still would have increased, but not by nearly as much," the CBO said. For Bivens, they're the result of 30 years of conservative-leaning policies that have undermined unions, left the minimum wage lower (adjusted for inflation) than it was in the '60s, and favored financiers and corporations over laborers. A big culprit is the deregulation of the finance industry, said Bivens, noting that the CBO identified finance as a sector that saw some of the largest jumps in income. "That sector has just taken a larger and larger share of the economy, while producing a, shall we say, dubious return," Bivens said. Bivens could not say with any certainty that economic crashes can be blamed on high levels of inequality, but he said that with so few people holding so much of society's resources while so many others scramble to maintain decent lifestyles, the economy has little cushion when bubbles, such as the housing market, pop. According to the International Monetary Fund, the pronounced degree of inequality today is likely holding back the economic recovery -- thereby prolonging the misery for millions of Americans who are out of work and the record 46.2 million who are currently living in poverty. Regardless of any linkages between income inequality and the broader economy, Bivens argues that it just isn't good. "It just strikes me as obviously unfair," he said. "You cannot convince me that the increases in the top 1 percent is a return to some meritocracy." The gap separating the richest 1 percent from the rest of the country has emerged as arguably the single most prominent rallying cry of the Occupy Wall Street movement, which began last month in New York City's Zuccotti Park and has since expanded to hundreds of protests around the country and sister demonstrations across six continents. And there's another coincidence that Occupy Wall Street and the 99 percenters might point out: It was the collapse of the Gilded Age that preceded many of the successes of the labor movement and the left. This article expands on an earlier version by Alexander Eichler published Wednesday afternoon.